“Exercise? I might fall. And I have arthritis, so I’m afraid exercising might hurt! I’ll just sit down all day—that’s the best lifestyle for me.” This senior’s idea is common, but in reality, it raises her risk of pain and falls all the more! Most of us know that exercise is important for good health. But did you know that even if we exercise regularly, spending most of the day sitting down is bad for our health? Study after study has shown that a sedentary lifestyle raises the risk of heart attack, diabetes, cancer, stroke and back pain. It even hastens the symptoms of Alzheimer’s disease. After only half an hour of sitting, our blood flow is reduced by half. And researchers from Northwestern University School of Medicine found that for seniors, every additional hour spent seated raises the risk of disability. Sitting can have a startling effect on younger people. Recently, University of Copenhagen researchers had a group of young men spend two weeks in a highly inactive lifestyle. The result? At the end of the two weeks, the young men had lost one-third of their muscle strength. “On a par with a person who is 40–50 years their senior,” reported researcher Martin Gram. But what about people who actually are 40–50 years older than those young Danes? What happens when they are inactive? Said Gram, “Even though older people lose less muscle mass and their level of fitness is reduced slightly less than in young people, the loss of muscle mass is presumably more critical for older people, because it is likely to have a greater impact on their general health and quality of life.” In other words, seniors might lose less muscle than did the younger study subjects—but they have less to lose in the first place! So today, it is very rare to hear a doctor prescribe “complete bed rest” for a senior patient. There is an appropriate exercise regimen for seniors living with arthritis, the effects of a stroke, heart disease, osteoporosis, vision loss, dementia or almost any health challenge. Ask the doctor for a “prescription” for an exercise program that is safe and effective for a person with your loved one’s individual health challenges. Exercise needn’t be vigorous. Even small amounts of activity, spread out throughout the day, can reduce the pain, stiffness and depression that result from a sedentary lifestyle. Chair exercises, tai chi and walking at a comfortable pace are great for reducing pain, improving balance and depression busting. Yet even in the face of this information, many family caregivers are worried. “With your balance problems, it wouldn’t be safe to go for a walk,” they might say. Or, “At Mom’s age, exercise doesn’t make much difference.” “We would worry about you if you went out for a walk alone!” Or maybe the doctor recommended an exercise class at the senior center three mornings a week. Dad doesn’t drive, everyone else has a job—how will Dad get there? This is where home care can be a tremendous resource to help seniors benefit from physical activity. 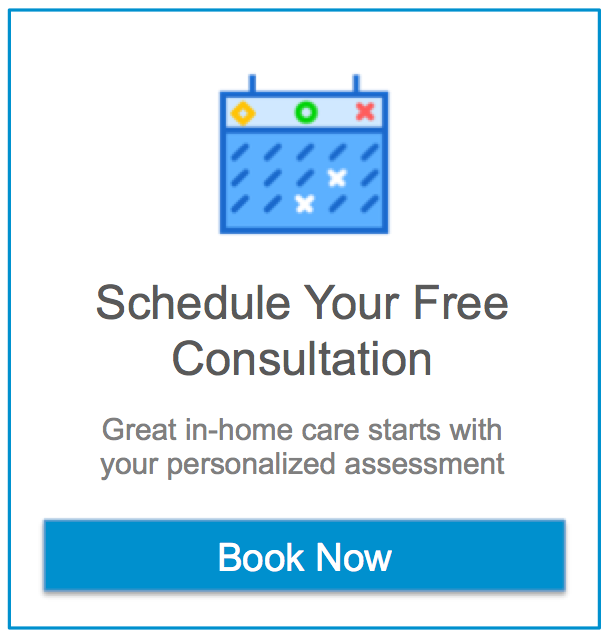 Your family may already be using home care services, or considering this resource for helping your loved one with bathing, dressing, grooming, meal preparation and housekeeping. The caregiver can also help your loved one cut back on those couch potato hours. Once the doctor has prescribed an exercise plan for your loved one, the caregiver can provide support, supervision and encouragement at every step. The doctor might suggest a set of home exercises, an exercise DVD, or a couple of short walks each day. Having a home caregiver nearby, as both cheerleader and safety coach, can provide motivation and confidence to stick with it. The doctor might suggest that your loved one take part in a senior exercise class at the gym, senior center or parks department. This is a great way to get an appropriate workout, and enjoy the company of others. But unless your loved one can drive or family are available to do so, your loved one might miss out on this fun and healthful opportunity. The caregiver can provide transportation, and help your loved one get dressed and ready. Maybe on the way home, a stop at the grocery store is in order? Exercise can pique the appetite like nothing else! The caregiver can prepare meals and snacks that further support your loved one’s well-being and energy level. Trained caregivers also help reduce the risk of falls. The caregiver will know the importance of removing clutter and other hazards, both indoors and out, and will also be alert to uneven pavement, a child’s tricycle or slippery leaves that a senior who is using a cane or walker, or has impaired vision or balance problems, might not notice. Home care can help your loved one increase activity—but what about you? All the research at the beginning of this article is for you as well. And no, driving Mom to the doctor doesn’t count as exercise. Many family caregivers spend so many hours each week helping their loved one—to say nothing of their jobs, other family obligations and duties—that exercise quickly falls to the bottom of their to-do list. This is not good! There’s an old saying: taking care of yourself is an important part of caring for your loved one. When a professional takes over some of the caregiving tasks, this provides the respite to allow family to care for their own health. Now that you’ve finished this article, it’s time to get up and work out! Need a little motivation? Check out the “Supporting Senior Exercise” puzzle in this issue of the Assisting Hands newsletter!